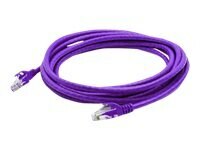 This is a 3ft purple Cat6A molded snagless patch cable. Cat6A (or Augmented Category 6) allows frequencies up to 500MHz, which is twice that of regular Cat6. It performs at improved specifications, in particular in the area of alien crosstalk as compared to Cat6 UTP (unshielded twisted pair). When used for 10/100/1000Base-T, the maximum allowed length of a Cat6 cable is 100 meters or 328 feet. With its improved specifications, Cat6A does not have this limitation and can run 10GBase-T at 100 meters (328ft) without electronic testing. Each cable is 100% tested for insertion loss before you take ownership. Our patch cables are 100% compliant for all of your networking needs. Our products are guaranteed by federal law to not affect or void OEM warranties.